Here's a way to fiberglass DLG tail surfaces without the cost of an expensive vacuum bagging setup. 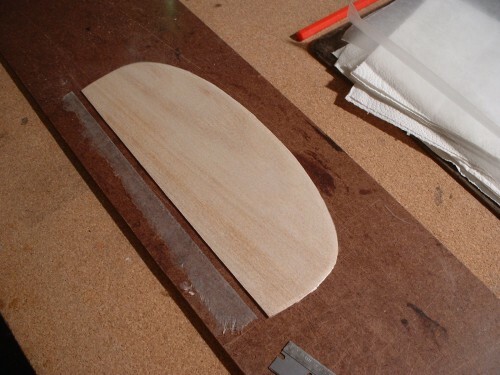 This method works with balsa sheet tail surfaces and, with one addition, works with foam surfaces too. Place eight layers of paper towels on a flat surface (I use an old Walmart clipboard with the clip removed). A smooth surface piece of masonite works. Place a layer of wax paper over the paper towels. Center the balsa sheet surfuce to be fiberglassed (previously cut and sanded to shape). 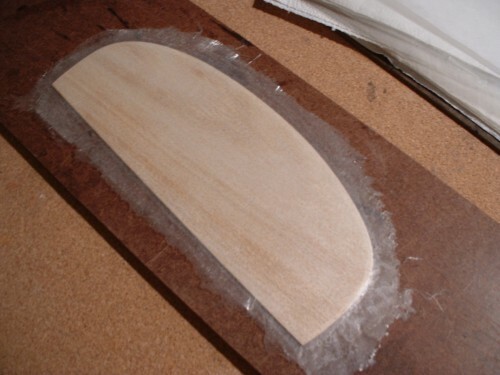 Cut a piece of light weight fiberglass on a bias about 1/2" larger than the surface you want to cover. 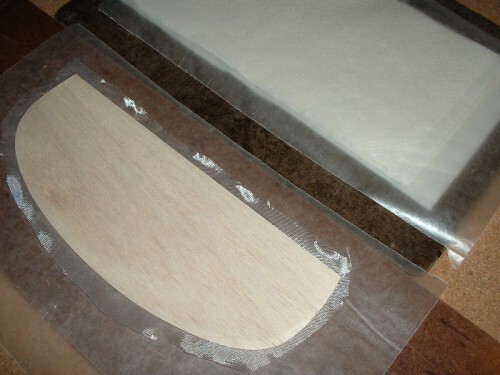 Place the fiberglass on a sheet of waxpaper and mix some 30 minute epoxy on another piece of wax paper. Apply the epoxy over the fiberglass, using a single edge razor blade for a squeegee. Hold the blade at an angle. You want to wet the glass but you also want to remove as much epoxy as you can. 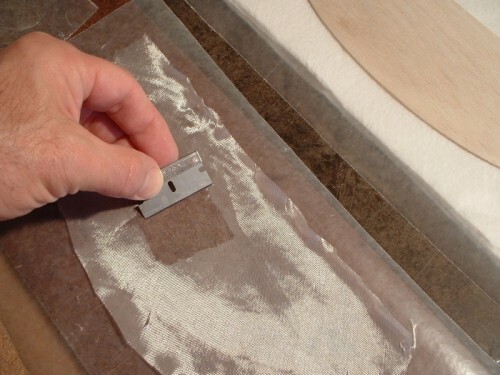 Fold a paper towel in half and press it down over the glass to blot some of the epoxy. Peel off the towel and fold it inside out and then press the towel down again to blot the epoxy again. 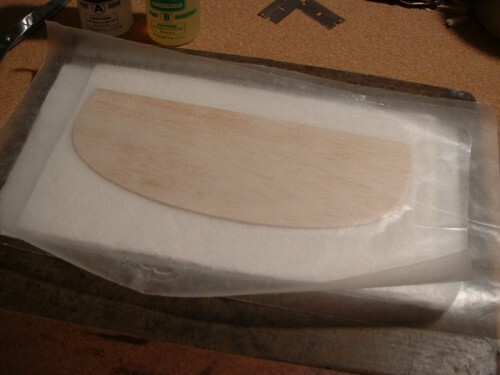 Lift the wax paper sheet with the wetted fiberglass and place it over the balsa tail surface. Press and smooth the glass onto the tail surface. Place eight layers of paper towels on top. Place a heavy hardback book (large enough to cover the tail surface) on top. Place a number of heavy books on top. 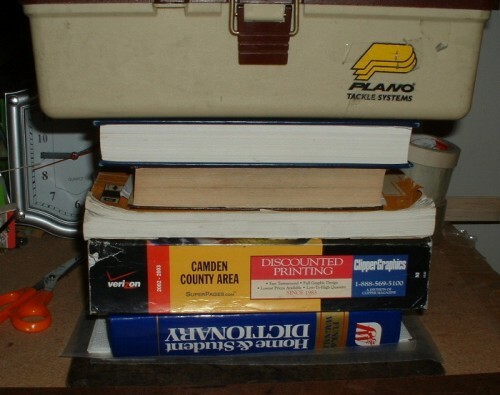 I then place my heavy field box on top of the books - total weight about 22 pounds. Leave this sit for three or four hours and then remove the weights and turn the wax paper sandwitch over. Carefully remove the top piece of wax paper and fiberglass the other side of the tail surface in the same way. Leave the weights on this for at least three hours. Trim the extra fiberglass from the tail surface with a razor blade. Glass should conform to rounded edges (that's why you need the paper towels and lots of weight). The first time I used this method for a foam tail surface, I was surprised to find out that the pattern in the paper towels was imprinted into the foam. To eliminate this imprinting, place a few sheets of newspaper between the paper towels and the wax paper. 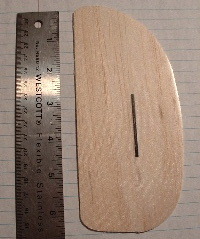 This is a fin/rudder for a 34.5" span SAL glider. It is not the size of a fin/rudder for a 1.5 meter DLG. The beauty of this method is that the equal thickness of paper towels above and below the tail piece, distributes the weight equally above and below the tail surface. This means that a tapered trailing edge is not twisted downward by the weight above, as long as there is equal compressibility above and below the tail piece. Of course this only works as long as the paper towels are not fully compressed. In order to improve the edge contour you can add more weight but you might also need to add thicker layers of paper towels. A flat hard surface both below and above these paper towels is necessary to help distribute the weight evenly - that's the reason for the large hardback book being the first weight on top. Another clipboard (without the clip) could be substituted. Please follow the blotting instructions. If you blot just once, you wind up with too much epoxy and weight. If you blot three times, you wind up with not enough epoxy and the fiberglass can be peeled off the tail surface. Blot twice. I'm not sure that it makes a difference which brand 30 minute epoxy you use, but I use Northeast Hobby Products (NHP) available from Tower Hobbies. In a perfect world, a bagged object would have equal pressure at each point of the object. In the wax bagging method the thickest part of the airfoil has the most pressure on it. An alternative to wax paper is the clear plastic acetate normally available in office supply stores. I have not tried it but others have reported good results with it and a more glossy finished surface. 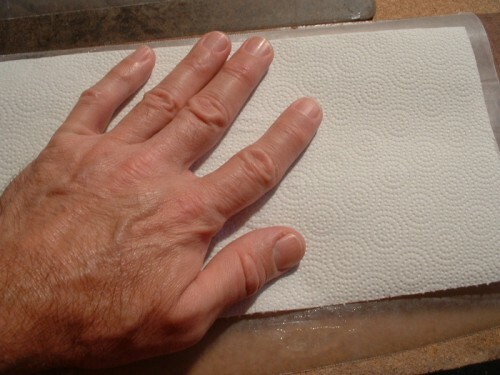 Some people have used a type of urethane foam in addition to or in place of the paper towel cushions. As long as the foam is thick enough and firm enough, it should serve the same purpose. 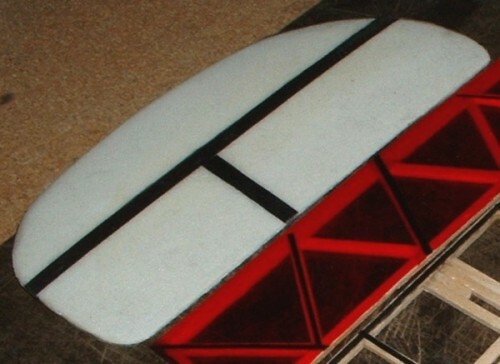 It's a good idea to use carbon fiber reinforcement when glassing foam tail surfaces. The vertical CF on the dlg fin in the photo only needs to go about 65% up from the bottom on each side. The hinge line is cut just aft of the trailing edge of the verticle CF reinforcement. Foam has very little compressive strength so the CF must be on both sides. You can wrap the edges of the foam with kevlar for abrasion resistance. Andy Meysner has been using Polycrylic instead of Epoxy with good success. Polycrylic does need air, but if you leave it long enough it will still dry. Leave it at least 24 hrs. Give it a very thorough blotting with paper towel on both surfaces before you put it between the mylar/film/wax paper, whatever you are using. Make sure you do a test piece first though, because with some types of plastic it will stick and you won't be able to remove it at all easily. I tried plastic food wrap once and that does not work at all! Some types of transparent photocopy film work well. Personally I much prefer polycrylic to epoxy.